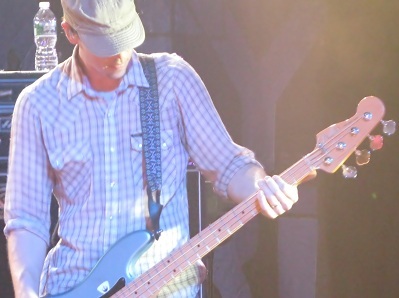 Arizona quartet Jimmy Eat World arrived in Sayreville, New Jersey, on a Friday night to support Invented, the band’s latest full-length effort on Interscope Records. Much of the band’s tour supporting the album features standout openers We Were Promised Jetpacks, but the small-town New Jersey date was booked separately from the main tour (which also stops for two nights in New York City in mid-October) with support from local act Brick and Mortar. 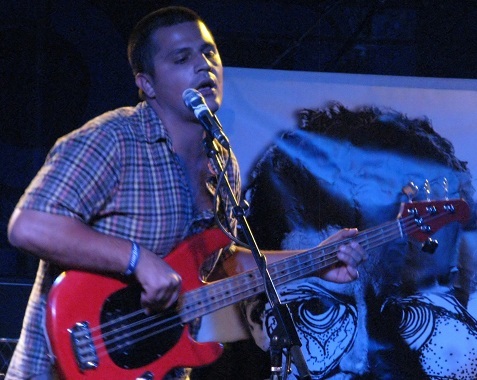 Brick and Mortar began just before 8PM, playing cuts from the recently released 7 Years in the Mystic Room EP. The duo, comprised of New Jersey natives Brandon Asraf and John Tacon, combines electronic beats, funky bass lines, and powerful drumming. Unfortunately, the parts are better than the whole, which is all but ruined by Asraf’s vocals. It’s a shame, because individually Tacon’s drumming is absolutely explosive, and Asfraf’s riffs are at least interesting. The pumped in beats take away from the band’s otherwise urgent demeanor, so even when Brick and Mortar look like they might shine, it’s dulled out by the monotonous, pre-recorded loops. It’s hard to believe promoter AEG couldn’t find any better acts to fill thirty minutes. Bleed American contributed a quarter of the setlist, including an absolutely stellar performance of “A Praise Chorus”. Another pre-millennium cut (the second of four songs from 1999’s Clarity) “For Me This Is Heaven” was fantastic, with additional keys and female vocals coming from Courtney Marie Andrews, transforming the rock-and-roll four-piece into a keyboard-backed quintet for a third of Jimmy Eat World’s set. Her voice adds texture to old favorites like “Hear You Me” and new cuts from Invented like “Evidence” and “Movielike”. “Big Casino” elicited extra elation from the crowd during the chorus (“I’m the one who gets away, I’m a New Jersey success story”), the song coming to life in a form not realizable in its studio version. Similarly, the seemingly feeble “Coffee and Cigarettes” actually works when Adkins breathes life into the song in front of a crowd. “Blister” polarized the crowd: fans only recognizing the band for singles like “The Middle” stood awkwardly next to the older concertgoers as the latter group sang in unison to the song’s repeating, heartbreaking chorus: “How long would it take me to walk across the United States all alone? / The West coast has been traumatized / I think I’m the only one still alive”. A seven minute take on “Goodbye Sky Harbor” beautifully wrapped up Jimmy Eat World’s set with Adkins looping his vocals over the song’s building outro. As the song neared completion, Adkins’s voice filled the sold out Starland Ballroom, yet he stood there silently, lost in a sea of his own looped vocals perfectly fitting the song’s instrumentation. Jimmy Eat World put down their instruments, thanking the crowd while retreating backstage for a deserved moment of rest: the band undoubtedly poured their hearts into their first sixteen songs. The lengthy “23” started Jimmy Eat World’s premeditated return, continuing on the placid mood created just before the encore. Futures hit single “Pain” shattered that calm with Zach Lind’s relentless percussion inviting the crowd to once again dance along. “The Middle” kept things moving, with Adkins tearing through the song’s crafty solo. 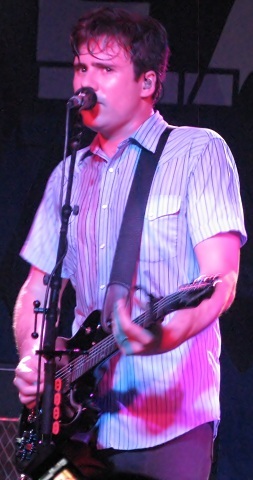 “Sweetness”, with its original demo introduction, ended Jimmy Eat World’s set on the night’s highest note, unquestionably leaving fans wanting more. A classic show business maneuver. It’s unlikely Jimmy Eat World has ever sounded tighter during their eighteen-year career than they have as part of the Invented tour. The quartet was unrestrained for just under ninety minutes, pouring unbridled emotion into every moment of the setlist, even on now-dated Clarity songs and tired singles. Jimmy Eat World returns to the area for two nights in New York City’s Terminal 5. With the setlist liking shifting to include a few more songs from the excellent Invented, at least one of those nights is a must-see event — even for those who caught the band at Starland Ballroom. You are currently browsing the archives for the Brick and Mortar category.